At the same time, I realised that there is virtually no information about this unit on the internet. I put some details up on a forum, and submitted some pictures and information to Radiomuseum.org, but having taken the photos, I thought it was worth a brief article on here. As obscure test equipment goes, this is pretty obscure! Fundamentally, this box generates a composite FM stereo signal. It has an internal audio frequency oscillator, or it can take an external source of audio. Once the stereo signal has been multiplexed by this unit, it could be applied directly to a stereo decoder stage - useful for circuit development - but more typically the multiplex signal would be fed to a suitable FM modulator before being received by the "radio under test". Radiometer supplied a suitable unit for this purpose, but I don't have one - but fortunately, I have a couple of RF signal generators that allow external FM modulation. It's worth saying that an earlier model - the SMG1 - includes a 100MHz modulator, so it can be connected directly to a radio receiver. I also have one of these, but it does take up a lot more space on the bench - however, if I didn't already have the RF signal generators in situ, the SMG1 would be a more convenient unit. Stereo encoding is an interesting topic in its own right, and it's worth a quick summary of the principles. Relatively soon after the introduction of high quality FM broadcasting, the search for a way to carry stereo content began. Many possibilities were considered, with the Zenith/GE scheme being ultimately adopted. The key requirement was compatibility with existing FM receivers, which were horrendously expensive back in the day. To achieve this we don't directly transmit the left and right channels - which, on the face of it, seems like a perfectly logical thing to do - M and S signals are sent instead. The idea being that a mono receiver will pick up the M signal and completely ignore the S component. Meanwhile, a stereo set would receive both and be able to recreate L and R from M and S.
The M signal is simply the sum of left and right - i.e the mono content. The S signal is the difference of left and right, and represents the stereo content. In the receiver, it's very easy to make left and right from M and S: you simply sum M and S to recover the left signal, and subtract M and S to get the right channel. Fortunately, adding and subtracting signals is very easy to do with very straightforward electronics. Having converted the incoming stereo audio to M and S, the M signal occupies the baseband audio range of 30Hz to 15kHz of the signal that will be applied to the transmitter. As mentioned, mono radios receive this and nothing else. Meanwhile, the S signal is modulated on a 38kHz carrier, occupying a range of 23 to 53kHz. The carrier is surpressed, but both of the sidebands are sent (this is DSB-SC - double-sideband surpressed carrier). In order to demodulate this signal, the 38kHz carrier must be recreated in the receiver, so a 19kHz pilot tone is broadcast. This tone is phase-locked to the original 38kHz carrier, and the receiver simply needs to double it back up to 38kHz. As if that isn't complicated enough, FM broadcasts use pre-emphasis. Simply, the higher audio frequencies are boosted before being applied to the transmitter. 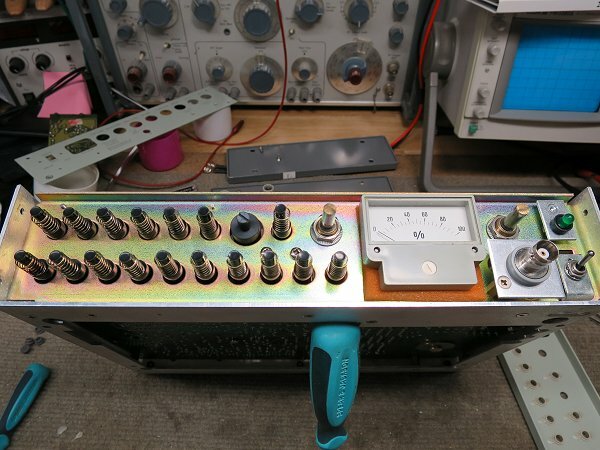 At the receiver, a corresponding treble-cut is applied to restore the correct balance, simultaneously reducing the noise. This works especially well for FM as the noise density rises at high frequencies. This simple idea was widely used in audio applications such as tape recording; indeed it is even an option for CD - albeit a rarely used one. Naturally, these pre-emphasis curves are defined carefully, and there are different standards. For the US and South Korea, 75µs is used; elsewhere it's 50µs. Neither of my RF generators support pre-emphasis, which is perfectly normal for general-purpose signal generators - FM broadcasting is merely a specialism, after all - but the SMG40 does. This facility alone is very useful to me - even if I'm working on a basic mono receiver - as currently I have to manually account for pre-emphasis in my performance measurements, which is a pain! As this extract from the service manual shows, the SMG40 supports both 75µs and 50µs, along with 25µs, which was a Dolby FM standard. The use of pre-emphasis brings about an interesting point about audio levels. The maximum allowable deviation of a broadcast FM radio station is 75kHz, and exceeding this is likely to be frowned upon by the authorities! So the audio levels applied to the input of the FM modulator must be carefully controlled to prevent over-modulation. As a last resort, the input stage of the transmitter will have a hard limiter, but this sounds unpleasant and is best avoided. As such, immediately before the transmitter will be a processor, which is a highly sophisicated and highly configurable box of electronics; essentially a multi-band compressor that is set up to ensure that the signal never hits the subjectively unpleasant safety limiter in the transmitter, but that the audio is only a fraction of a decibel away from doing so. In addition, the compression substantially raises the average level of the signal, giving the impression of your signal being stronger than others. And so the "Loudness Wars" spreads to radio! But the maximum signal level that can be applied to the transmitter applies at any frequency - it doesn't matter if we're talking about bass, mid-range or treble. Until we apply pre-emphasis. If we are going to boost the treble immediately before the transmitter, then we run the risk of over-modulating the transmitter. In practice, we are lucky that most programme content is heavily weighted towards the bass frequencies, and that there is relatively little energy at the top of the frequency band (although arguably things have changed somewhat since the standards were initially defined). But the more you think about this, the more you realise that it's a complicated issue - the processor that is doing the compression needs to be aware of the issue and account for it when deciding how to compress and limit the signal before it is applied to the transmitter. And how to perform basic frequency response tests of a complete transmitter-receiver chain? In short, you can see from the above curves that you have to reduce the input level by about 12dB relative to the maximum level to ensure that there is no over-modulation when the input signal reaches 15kHz. The modulation meter included with the SMG40 is useful for judging this point. The SMG40 is a compact unit - just 12 inches wide, 3 inches high, and 9 inches deep. There are bumps on the top panel that line up with the feet on the bottom, meaning that equipment in identical enclosures can stack nicely. It sits nicely on a 2U rack shelf. As we've seen, the front panel has an impressive array of buttons and controls, but they are logically grouped. Some aspects of the function switching are a little complex - I'll come back to that later. But essentially, the left top row of buttons control the internal oscillator and the pilot tone. Below that are the main function switching plus the pre-emphasis options. Then there is a meter to show the overall level of the composite multiplex signal. Next, a level control and an output BNC connector. The power switch and LED complete the lineup. We have the mains voltage selection, input IEC connector and mains fuse. By removing the plate, the unit can be configured for 115V operation. The other sockets are best tackled from right to left. The external left and right inputs are obvious enough. However, "SCA" might not be. Earlier we briefly looked at the makeup of the composite signal, and mentioned that RDS and other stuff might be added to the mix. Well, that's how. Whatever signal you apply to that BNC is simply added to the output signal. Now, this unit pre-dates RDS, but SCA stands for Subsidiary Communications Authority. Any signal up to 100kHz can be applied to this input. Next, a socket labelled "Composite". Which is confusing because there is one of those on the front panel! However, this one has a fixed amplitude, whereas the one on the front is fully variable. The level is set to 795mV (peak), which is not a reference level I'm familiar with - presumably it is or was a standard somewhere. The DIN socket labelled "RF Unit" carries the composite signal again (also fixed - the same feed that goes to the adjacent Composite socket). Curiously, it doesn't seem to appear on the schematics, but the manual gives details in the specifications. 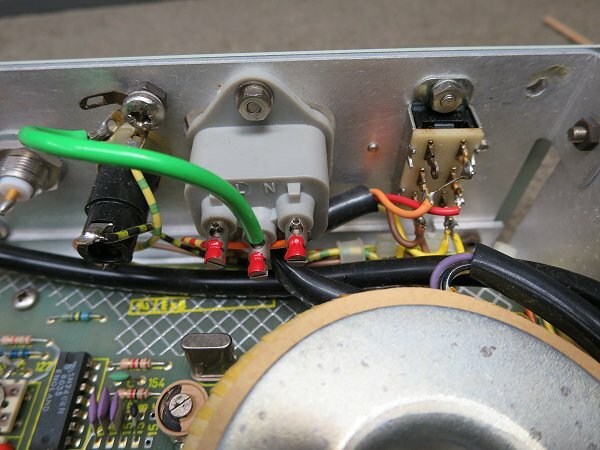 In addition to the signal, all power supply rails (+5V, ±15V) are present, and the socket is for the connection of a dedicated FM modulator. The Mod Sync socket is the output from the internal oscillator, fixed at 1V peak. This is permanently dedicated to this oscillator, irrespective of the setting of the EXT. switch (when in external mode, the oscillator runs at 80Hz). The Pilot Sync socket provides access to the 19kHz pilot tone. It's not a perfectly filtered sine wave, but it's not bad. It's useful for when you need to phase-lock additional signals to the pilot (e.g., the 57kHz RDS carrier is phase-locked to the 3rd harmonic of the pilot tone). In my haste, I'd also removed the oscillator PCB before reaching for the camera. And in the process discovered that the front panel switches are not as simple as you might expect (I'll get back to that shortly). But for now, you can clearly see that this is a fine example of early '80s technology - all through-hole stuff that you can actually see! The PCB is a decent fibre-glass affair with through-hole plating - none of those silly rivets or anything. There's a decent mixture of TTL logic and analogue goodness in there, along with some exposed mains terminals to catch the unwary. The mains transformer is obvious enough - a decent torroidal unit with an electrostatic screen. The three linear regulators are nearby, along with their smoothing capacitors. These are all in excellent condition - indeed, I only found one suspect capacitor in the whole unit. Not bad for 35 years old! Next to the mains transformer is some TTL logic that includes the master oscillator and dividers, and the signals generated there are passed to the modulators (the socketed ICs, which are CA3054 transistor arrays). The pot cores are part of the composite output filter, and above those are the output stage and the meter drive circuit. Below the filter is the input processing. Note the myriad pre-set adjustments. As you can see, it's pretty simple. It's a Wien bridge type, using a thermistor for amplitute stabilisation. The potentiometer is to set the level of the sine wave, and is a screwdriver adjustment. Also, the external input switching is done on this PCB - the two visible op-amps are related to this (the oscillator op-amp - an LM318 - is hiding behind one of those large ceramic capacitors in the centre of the PCB). 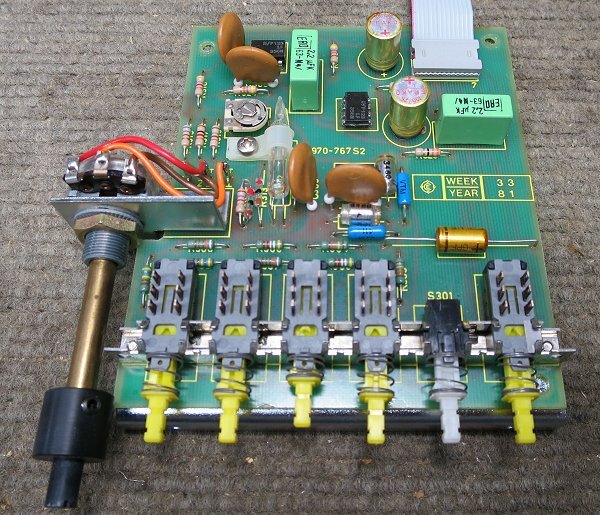 The external signals are buffered by those op-amps before being returned to the main PCB. The right signal goes via the EXT switch, but confusingly, the left does not. The switching is slightly non-intuitive - I'll get back to this later. Note the date code on the silk screen of mid-1981. The date codes on the components vary from between 1979 and 1981. They've gone to a lot of trouble to make sure you never need to remove the main PCB from the chassis. The layout is clearly hand-taped, and it's one of those PCBs that's been over-tinned before the solder-resist was applied (very common in that era, of course). I don't recall seeing an IEC socket with screw terminals before, but within a week of finding this one, I found another on a Studer CD player. Here, they've done it properly - note the metal sleeves crimped around the stranded cable and the locking paint. The buttons are a loose fit onto the switches. Note the brass sleeve, which is a loose fit onto the switches and a friction fit into the buttons. However, I found that quite a few were loose and simply fell out of the buttons - not a problem when assembled, but watch for that when you take it all apart. Also note the spring which bears onto the rear of the front panel. When you remove the oscillator PCB, the buttons might or might not come with the board, but the springs will probably end up getting stuck in the gap between the front panel and the sub-panel. 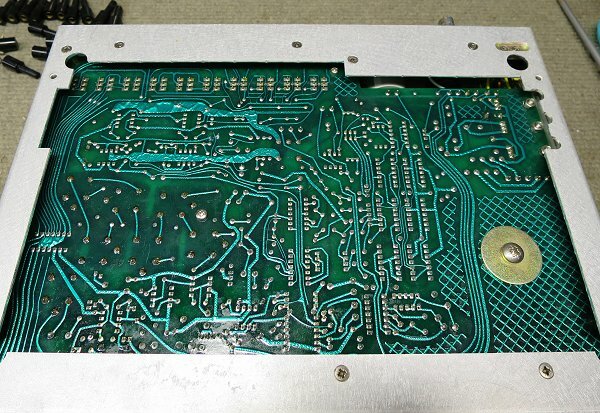 So before removing the oscillator PCB, it's best to remove the front panel first. Unfortunately, that involves removing the side panels as well. With care, it might be feasible to remove the oscillator PCB and collect all the switch parts as they come loose, but only if you're expecting it! This picture shows me reassembling the unit. I'd stood the unit upright, and placed the buttons and springs on. The front panel is placed over all this, but it's quite fiddly as you have to guide each button into its opening without disturbing anything else. You have been warned! Overall, I was very impressed with the construction of this unit. Yes, the front panel switches are fiddly, but once you know about it, it's not too bad to cope with, and the arrangement does improve the operational "feel" of the buttons. The exposed mains wouldn't be welcomed today, but 35 years ago this was pretty much par for the course. Access for service is excellent, the components are all top-notch, and so is the metalwork. Thumbs up! 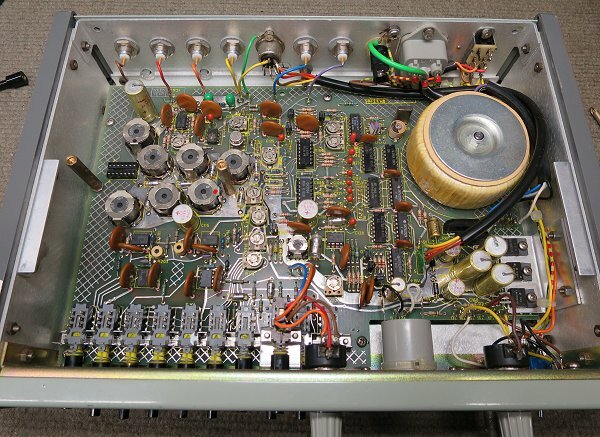 Oh yes - this unit had a fault... With no modulation signal applied to the system, the output signal consisted of something that looked like a distorted square wave. The main clue here was the frequency of this: 38kHz. Now, remembering that FM stereo uses DSB-SC, we're not expecting to see any component at 38kHz, and especially not with no modulation signal. This led me straight to the modulator circuit. I was lucky with this one. The obvious component to investigate was QA105 - one of the CA3054 transistor arrays. Furthermore, the IC was (a) socketed, and (b) I had one! And sure enough, the replacement fixed it. I'm not sure what contributed to its demise, but the replacement has been OK for many months now, so I'm hoping it's just random failure. I do have one more, but they are only available as NOS these days. If it fails again, I'll make up a substitute using regular transistors on a bit of Veroboard or similar, and will attempt to find out what is happening before installing my last good CA3054. I went around with my capacitor tester, but with just one exception, all measured very well indeed. The capacitor in question was C308 on the oscillator PCB - this looked slightly unwell at a glance, which you might spot in the picture above. A closer look reviewed that it had just started to leak. I replaced both with high quality units from Philips. The only other work was to apply some switch cleaner to a couple of noisy switches. Nothing else amiss could be found. I decided to go through the calibration process. Be warned - this is lengthy, complex, and requires some pretty specialist equipment. Fot the items I was lacking, I was able to improvise to a reasonable extent, but to do this you need to have a good understanding of what you're trying to achieve. The manual is pretty good on the whole. Also, they have provided test points on rows of pins, which makes it very easy indeed. I assume that in the factory, they had a jig with cables that plugged directly into these pin headers. A good bit of industrial design. As mentioned earlier, some aspects of this unit are confusing. Specifically, the behaviour of the function and external input switching is not quite as things appear from the front panel. When in "L&R" mode, the internal oscillator is fed to the right channel, but the left signal comes from the left external input. Huh? Selecting "EXT" removes the internal oscillator from the right channel, replacing it with the right external input. But again, the left channel comes from the left external input. From the way things are labelled, you can be forgiven for assuming that the "EXT" button would take both left and right from the external sockets and route them to the left and right inputs of the encoder, but no. The block diagrams in the manual don't really help either. Yes, I've used BBC colours for left and right! This diagram shows the external input sockets and their unity gain buffers, the internal modulation oscillator, where the pre-emphasis sits in the path, and how the switching is done. The left and right outputs of this are applied to the multiplex encoder via inverting stages. Obviously, this is a simplified diagram, so you will note differences when you compare it to the schematics in the service manual. As you can see, the EXT. switch also switches the signal to the blue path. This means that when using the internal oscillator, things behave reasonably logically - apart from when in "L&R" mode. When in EXT mode, the incoming left signal is applied to the blue path, and that's the signal that is used for the various modes. All of this detail is impossible to determine from looking at the unit itself, and while it's described in the manual, I didn't find it was all that clear. Hopefully this summary will help someone else in the future. A lovely bit of retro test gear, and a welcome addition to the bench. Certainly, it's a niche product, but when you need to set up a stereo radio receiver, it's essential. I tend to do more mono vintage sets than modern stereo gear, but the inclusion of pre-emphasis is very useful for any type (I was close to building my own pre-emphasis filter, but this saved me the hassle). The unit is permanently connected to the "external modulation" input of my RF generator and is used for checking the audio quality through the complete radio system. And very useful it is too.